Beltsville, MD, January 6, 2010 — Empress Software, developers of the advanced, agile Empress Embedded Database, announces the immediate availability of Empress SQL Master, a convenient, new SQL learning application for the Apple iPad. invites anyone looking to get down and dirty with SQL to download and use Empress SQL Master for free via the iTunes store. 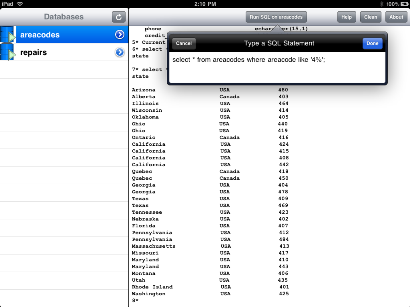 SQL Master is a command-line application designed for the Apple iPad. In a jiffy, SQL Master users can master SQL (Structured Query Language), the standard language for accessing databases. Empress SQL Master provides a highly flexible, command-line environment for running SQL commands using a real, live database system. It uses the Empress Embedded Database, an advanced, high performance database, to manage data. Empress can easily manage data in multiple databases. Users can practice how to make, create, change, and delete databases. Empress SQL Master also provides a handy “Help” feature that lists common commands, concepts, and what they are used for, providing a core understanding of SQL concepts. Empress SQL Master is available for free from the Apple iTunes store. in key word “SQL Master” to find and download a copy for your iPad or go directly to http://itunes.apple.com/ca/app/sql-master/id401237390?mt=8 . Empress Software develops and supports the EMPRESS EmbeddedDatabase management system worldwide. EMPRESS is a full-featured, high-performance database designed for embedded developers working with iOS for Apple, Linux, Windows, UNIX and real-time operating systems. EMPRESS has been utilized successfully in diverse embedded fields including data acquisition & instrumentation, networking & telecom, control & automation, automotive, security, and military & defense. For more information, check our web site at or send e-mail to info@empress.com or call Empress at 301-220-1919.